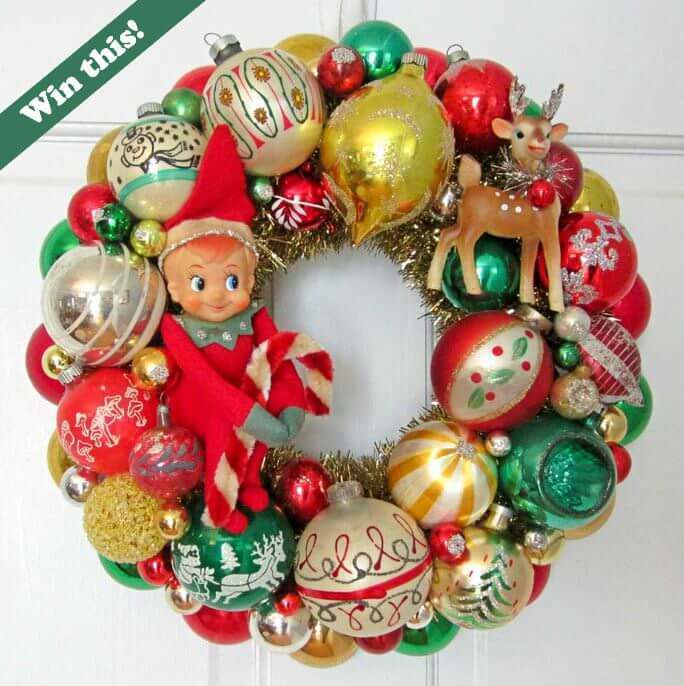 Home » Contests » Win this vintage Christmas ornament wreath made by Georgia Peachez — so shiny! so brite! Win this vintage Christmas ornament wreath made by Georgia Peachez — so shiny! so brite! Update: 12/7 — Congratulations to Heather, winner of the wreath. Her number came up! Thanks, all, for playing! It’s time for our most awaited giveaway of the year — a chance to win one of Georgia Peachez’ gorgeous vintage Christmas ornament wreaths — complete with vintage kneehugger elf made to order just for me — to give away to one of you! 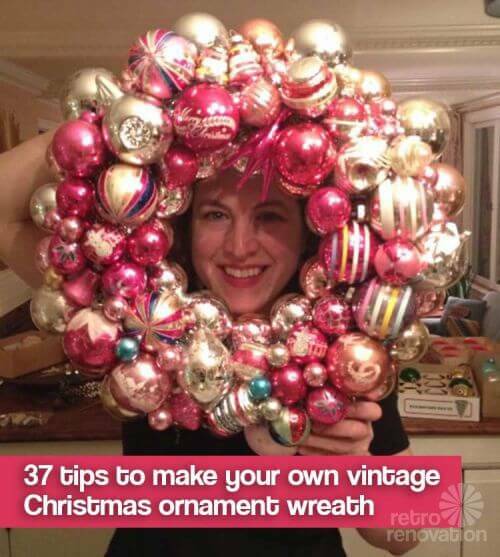 As far as I know, Georgia Peachez was the pioneer of the vintage ornament wreath, and has honed her craft to perfection. There’s nothing quite like an original GeorgiaPeachez creation! Read on for the rules to enter — and note, you can enter here daily now through Monday, Dec. 4. As far as I know, Georgia Peachez aka Suzy was the first one to make and sell these wreaths starting about 10 years ago. She started a phenom! In the last few years, Suzy has also started creating non-wreath vintage goodies, such as arrangements made in vintage vessels like head vases, retro toys and Christmas ceramics, as well as dioramas made using the vintage ornament boxes. You can see a lot of her adorable creations on GeorgiaPeachez’s Facebook page and in her online shop. 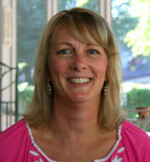 Bottom line, we just adore this artist and all she does! To enter, use the Comment field on this post below and tell us what is your favorite part of the holiday season. Or whatever, we’re easy. Repeate: Entries close on Monday, Dec. 4, 2017, around 5 p.m. Eastern — that is, Iwill close the Comments field at that time. Prize: There will be one winner. The winner will receive the vintage ornament wreath pictured above, made by the GeorgiaPeachez, mailed to you by Georgia Peachez. Pam will choose the winners via the Random Number Generator at random.org. I will check if the ‘winner’ is a newsletter subscriber. I will email the winner. [Tip: Be sure you enter your email address correctly in the email field of the Comment form.] The winner will have five business days to respond. If I do not hear from them, I will choose the next person after who commented. Lather, rinse, repeat. I will post the winner’s first name as soon as all is confirmed. Note, I ‘clean up’ all the comments before choosing. That is, if someone A replies to another’s comment within the same day that someone A entered, I take out A’s comment. Many thanks to the fabulous GeorgiaPeachez! from GeorgiaPeachez; she is covering the shipping — thanks, Suzy!. but to delight readers and to grow our newsletter list. You can read more about how we make money here. See our world famous tutorial on how to make these wreaths — the first feature box on our Wreath page. My favorite part is watching my Hubby and Sons put up tree and decorating it. Reading about the Meaning of Christmas on Christmas Eve night and watch “The Christmas Eve story and making food or the next day . My favorite part is winning wreaths!